No doubt you have heard the stories from wide-eyed anglers returning from the heart of the Indian Ocean. For those who have not yet been, the tales, while true, are hard to swallow: steady streams of large, aggressive bonefish flooding pristine flats, huge trevally and barracuda, mysterious schools of super-charged milkfish, and blue water rich with sailfish and wahoo. Often referred to in recent times as the best bonefishing in the world, the only downside to the Seychelles is that once you have fly fished here you will be forever spoiled. 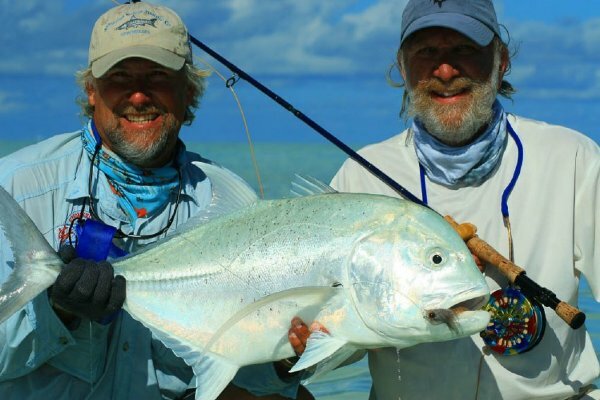 To complement the saltwater fly fishing is the unpretentious luxury of Alphonse Island Resort. Truly a world class resort, Alphonse offers guests refined international cuisine, tasteful waterfront chalets complete with private verandas, open-air showers, air-conditioning, en suite bathrooms, international direct access telephone, TV and mini-bar. The Seychelles sit approximately 1,000 miles off the coast of mainland Africa in the Indian Ocean. Bonefish, milkfish, triggerfish, barracuda, giant trevally. After entering the lagoon and mooring, you will transfer to skiffs, which are powered by Yamaha 50-hp motors and equipped with flares, flotation devices, rod holders, storage compartments, and coolers. Virtually, all fishing is by wading, however, should you wish to fish from the skiffs, the guides will gladly assist. Casting from the skiffs for trevally is productive in certain situations. They are also useful when hunting milkfish and invaluable once they are hooked. A packed lunch is provided by the hotel. An order form listing the menu selections is available in the fishing office. It should be completed and given to the fishing manager the afternoon prior to each fishing day. Two complementary soft drinks per day along with tap water are provided. Any soft drinks consumed over these two will be billed to your hotel room. Fishing days are approximately 8 hours, starting on arrival at the flats. If the entire group wishes to return to Alphonse earlier in the afternoon, this is no problem. Guides are instructed to stop fishing at 4:00 PM and return to the mothership. For safety reasons, all boats from the resort must be back in the mooring area at Alphonse no later than 5:00 PM. Please honor your guide’s request to stop fishing promptly. Sunday - Friday: Six Full days guided fishing. Saturday: Depart island for Mahe and points beyond. Rods: One 8wt, one 9wt and two 12wts. Reels: Four large arbor saltwater reels (two for 9wt and two for 12wt). Floating Lines: Five lines total – Two for your 9wt and three for your 12wt. Leaders: Four 9 foot 12 lb. saltwater tapered leaders, three 9 foot 22 lb. saltwater tapered. Tippet: Five spools of tippet. 12 lb., 15 lb., 18 lb., 22 lb., and 100-120 lb. Flies: Approximately 6 dozen flies for Bonefish, Indo-Pacific Permit. All these flies should be tied on Gamakatsu SL11-3H #6 hooks (note this hook is similar in style to a Mustad 34007 #4. Approximately 2 dozen trevally flies. All Giant Trevally flies should be tied on Gamakatsu SL12S #6/0 hooks.